Time to celebrate with us! TopVintage is celebrating 10 years in business and we invite you to enjoy the celebrations with us. That's why we have released an exclusive Anniversary Collection that includes this 50s Rachel Classy Handbag in Black and White! And it goes without saying that we celebrate in style ;-) Of course we have cake, bunting and balloons... but we think that this celebration also calls for a new handbag! 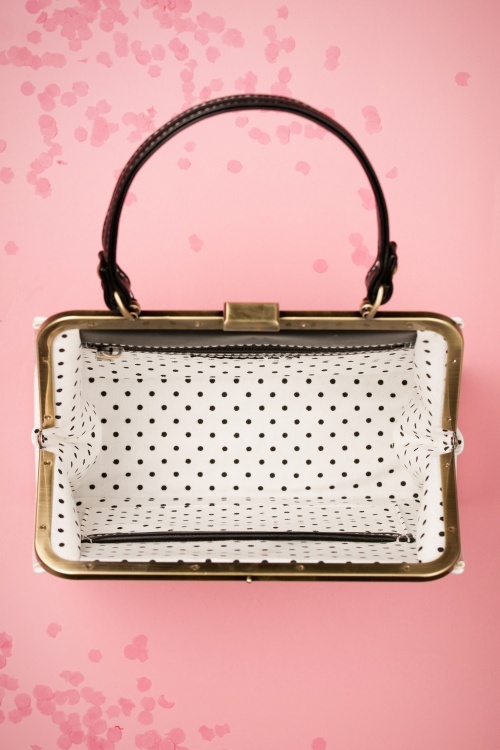 This small vintage inspired handbag is made of black and white faux leather with classy brogue detailing and a sweet black bow that adds the perfect finishing touch. This beauty features a short handle but she also comes with a longer, adjustable strap so you can wear her on your shoulder while you're showing your moves on the dance floor ;-) Show your purse-onality with this retro handbag!